Industrial designer Ian Mahaffy recently made the leap and set up his own design practice IMID (one guess as to what it stands for) in Copenhagen, Denmark, where he'd been working for the likes of Lego and Cisco for the past decade and a half. 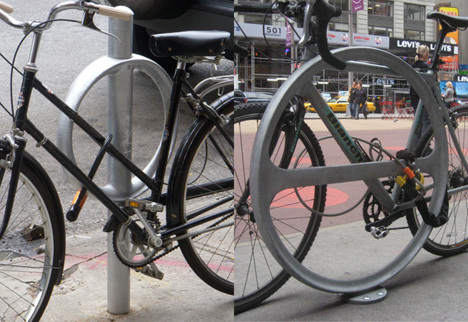 Earlier this year, he followed up on his last award-winning bicycle rack design, a collaboration with Maarten de Greeve, with yet another parking solution for the ever-growing population of cyclists in New York City: by adding a simple ring of steel to decommissioned parking meter posts, Mahaffy and de Greeve were able to otherwise useless posts as clever φ-like bike racks. This time around, Mahaffy is concerned with user behavior and the practical needs of fashion-forward female rider, a worthy cause insofar as user experience is as important as infrastructure when it comes to alternative transportation. 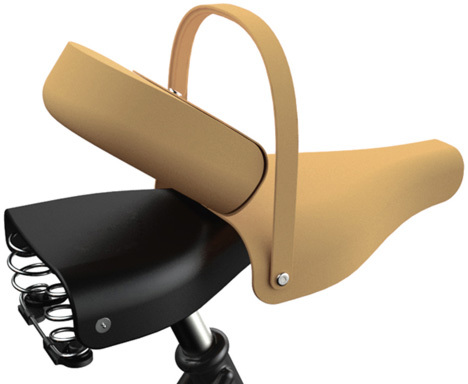 Enter the "Victoria" saddle bag:By initially observing how women carried their bags while cycling and the problems associated, along with the problems of using existing saddle bags in inner city environments. We started to think about how a bag could be more integrated with the bicycle, make for an easier ride and be easy to add and remove. 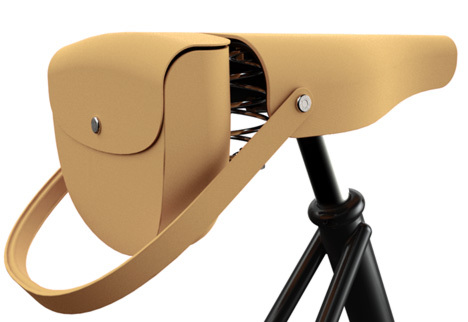 These observations lead to considering the relationship between the saddle and the bag. Initially we thought that there might be an idea in being able to take your saddle and saddlebag with you as you do your bag. 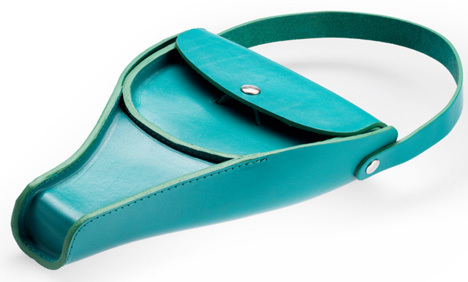 The bag and saddle integration became a functional product as well as something compelling and full of character. 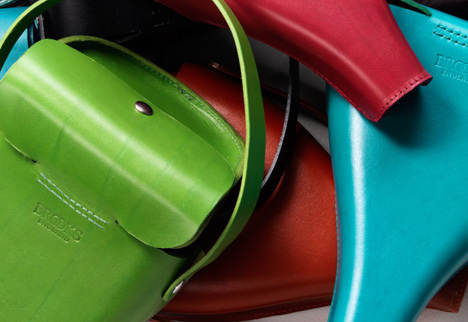 The bag takes on a very saddle look, which makes it very iconic as a bag form. A conscious decision was made not to hide much of the bag expression in its saddle use so as to express its other function while transformed. Existing saddle bags do not offer a friendly opportunity to 'take it with you' and are therefore not really a viable option when thinking inner city use due to risk of theft. While I'm always keen on the idea of streamlining transportation and cargo, I'm not sure as to whether the beautifully-crafted product represents the most practical way of integrating a bag. 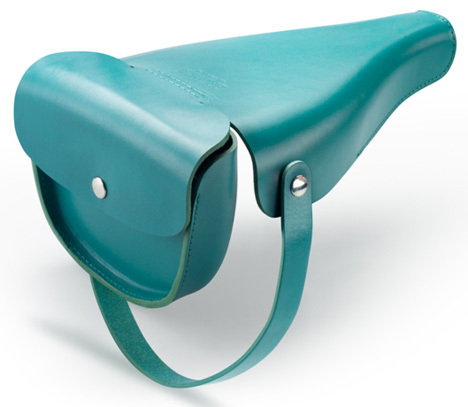 Similarly, I like the idea of taking the iconic silhouette of a saddle and reinvent it as a thing-that-looks-like-another-thing, but I'm not sure how well the loosely triangular shape is adapted for out-of-the-saddle use. 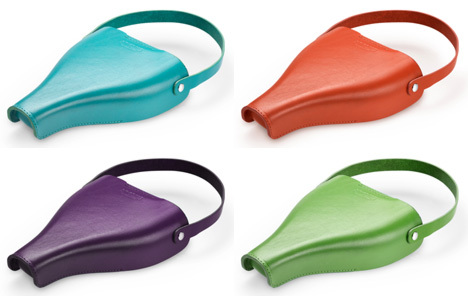 For example, the portion of the bag that fits on the nose of the saddle—i.e. the tip of the triangle—seems like it could be put to better use. 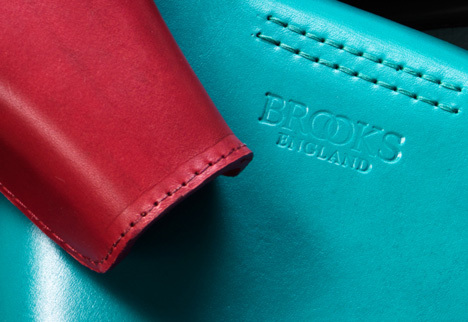 Any lady-cyclists care to speak to the practical utility of the "Victoria" saddle bag (available now exclusively through Brooks' online shop)?